Scaling Up Investigation 4.2. Warm Up Solve the following problems. 1. X = 7 16 22 2. There are 450 students and 15 teachers in a school. The school hires. 2 Warm Up Solve the following problems. 1. X = 7 16 22 2. There are 450 students and 15 teachers in a school. The school hires two new teachers. How many students should attend the school to keep the student- teacher ratio the same? 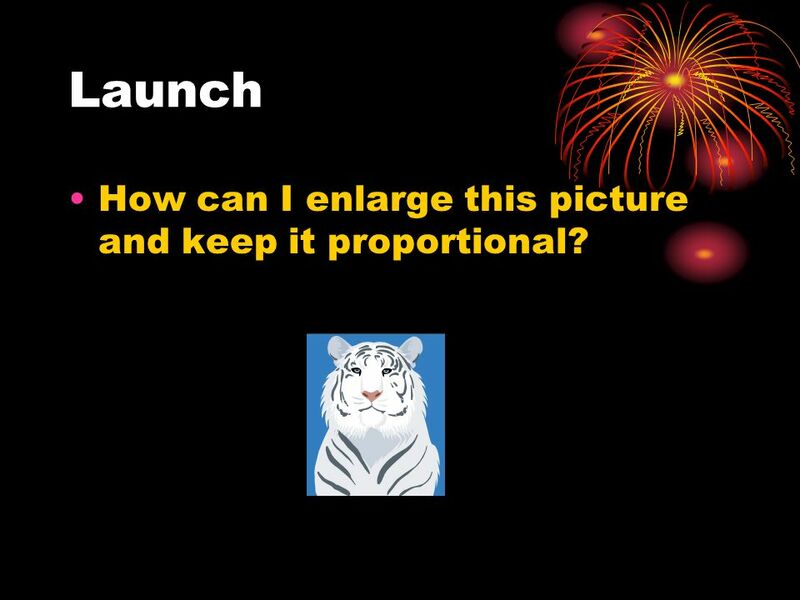 4 Launch How can I enlarge this picture and keep it proportional? 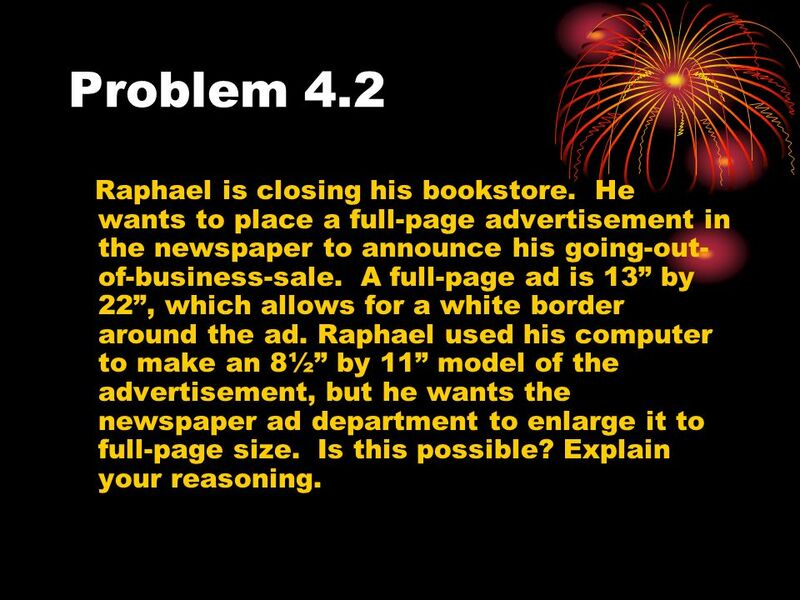 6 Problem 4.2 Raphael is closing his bookstore. He wants to place a full-page advertisement in the newspaper to announce his going-out- of-business-sale. A full-page ad is 13 by 22, which allows for a white border around the ad. 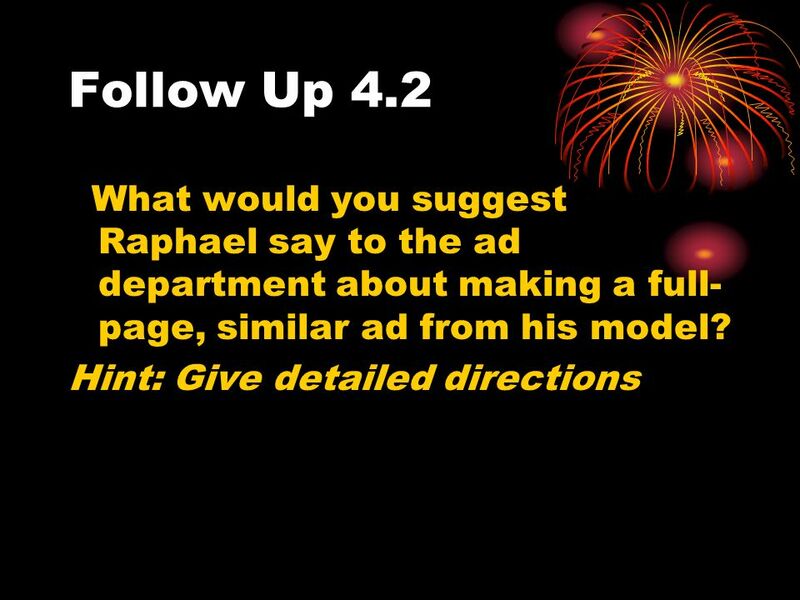 Raphael used his computer to make an 8½ by 11 model of the advertisement, but he wants the newspaper ad department to enlarge it to full-page size. Is this possible? Explain your reasoning. 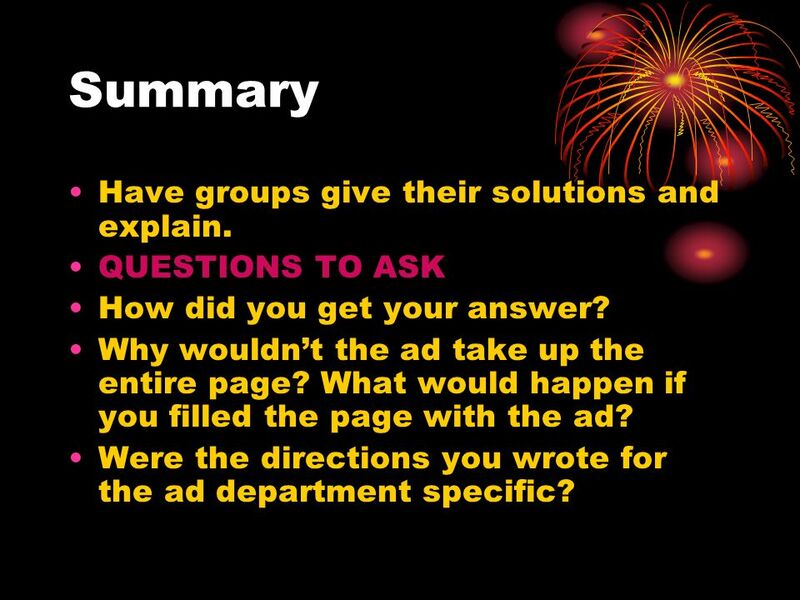 9 Summary Have groups give their solutions and explain. QUESTIONS TO ASK How did you get your answer? Why wouldnt the ad take up the entire page? What would happen if you filled the page with the ad? Were the directions you wrote for the ad department specific? 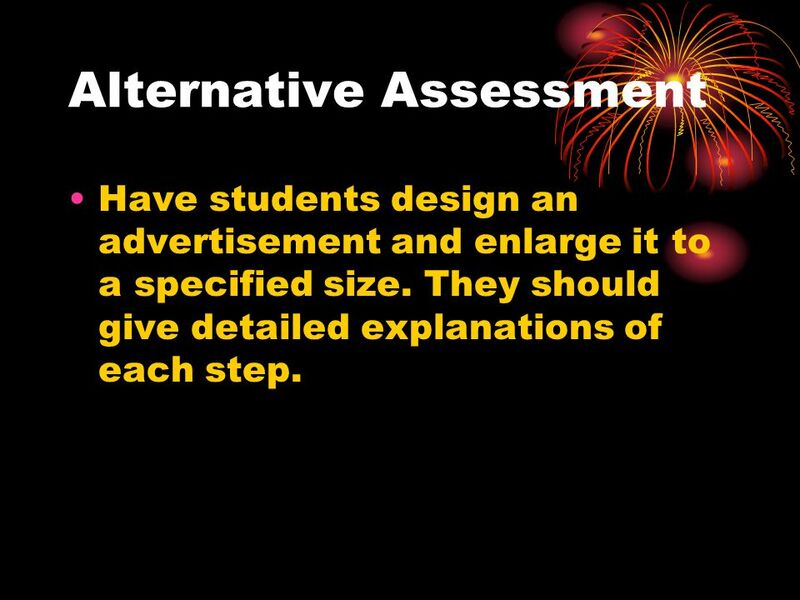 13 Alternative Assessment Have students design an advertisement and enlarge it to a specified size. They should give detailed explanations of each step. 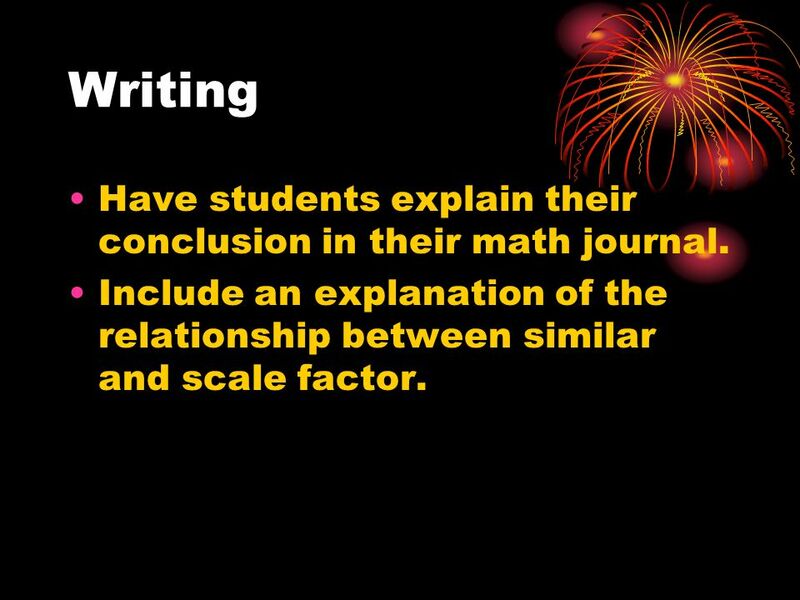 14 Writing Have students explain their conclusion in their math journal. Include an explanation of the relationship between similar and scale factor. 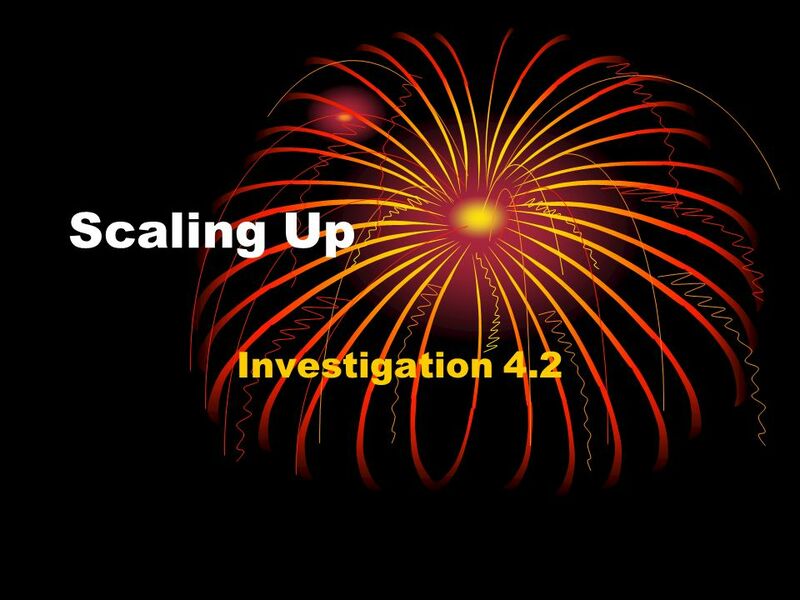 Download ppt "Scaling Up Investigation 4.2. 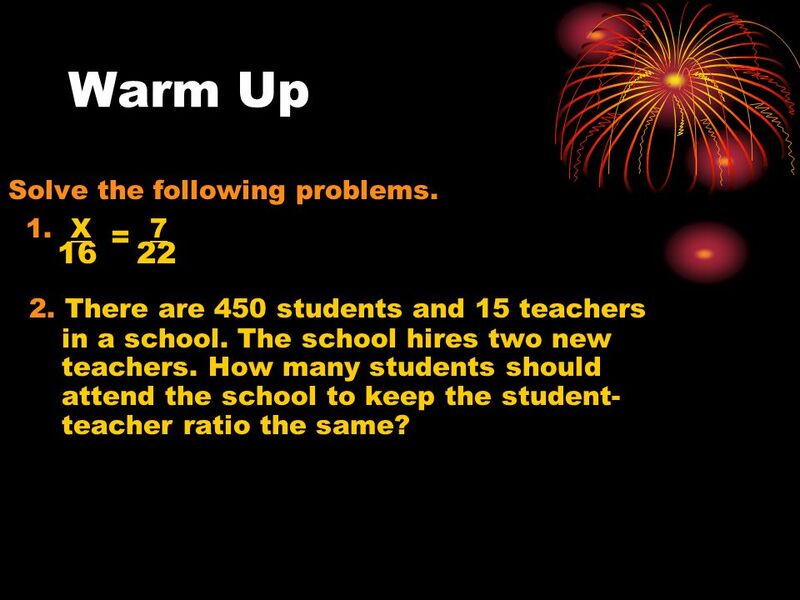 Warm Up Solve the following problems. 1. X = 7 16 22 2. There are 450 students and 15 teachers in a school. The school hires." Table of Contents Table of Contents. Graph dilations on a coordinate plane. Once I was asked by my teacher to draw a picture of a CD. I grabbed a ruler, measured out all dimensions (width and height) carefully. Then I drew the. 1. Warm Up: On the back of your lab sheet, answer the following questions. Agenda 2 3) Which of the following shapes are parallelograms? Explain how you. 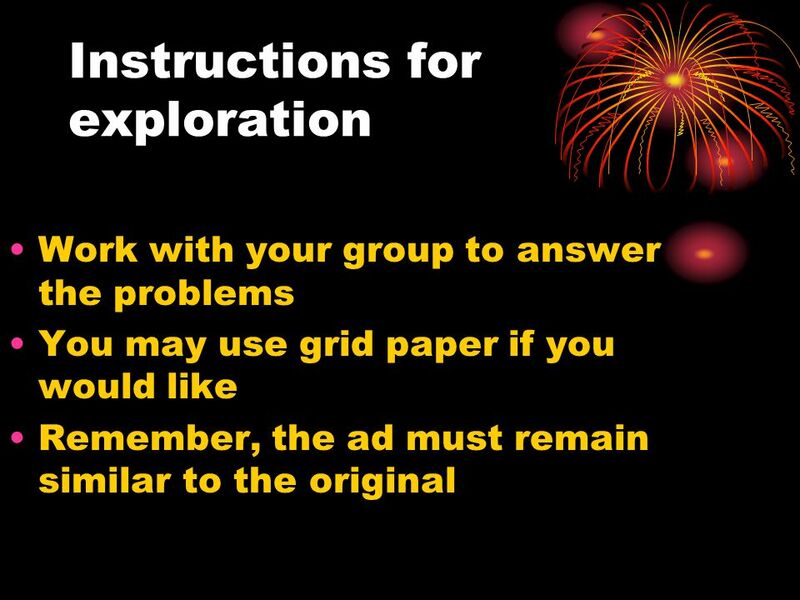 E-2020 Science Classes New Year 2012 Procedures. Vocabulary Write each vocabulary word Each definition, in your own words if possible Draw a picture to. Table of Contents. 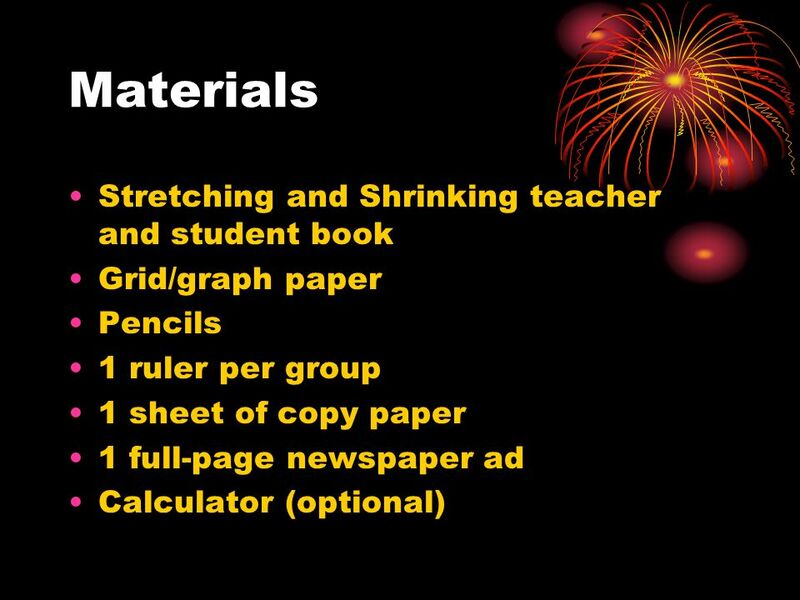 8 Shrinking and Stretching Pre Test Intro to Unit 9 Shrinking and Stretching 1.1 HMWK Variables and Patterns Work Book Pg Shrinking. 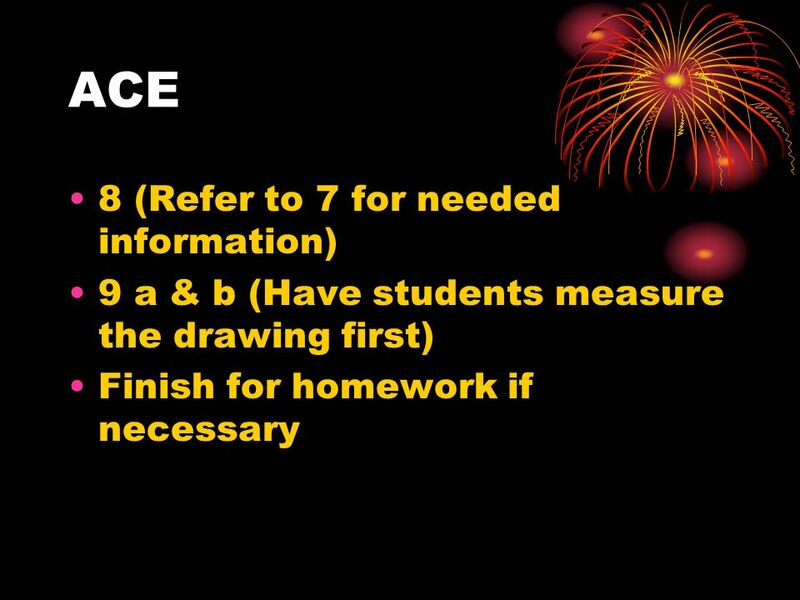 Geometry Today: ACT Check 7.5 Instruction Practice Even if you're on the right track, you'll get run over if you just sit there. Will Rogers. 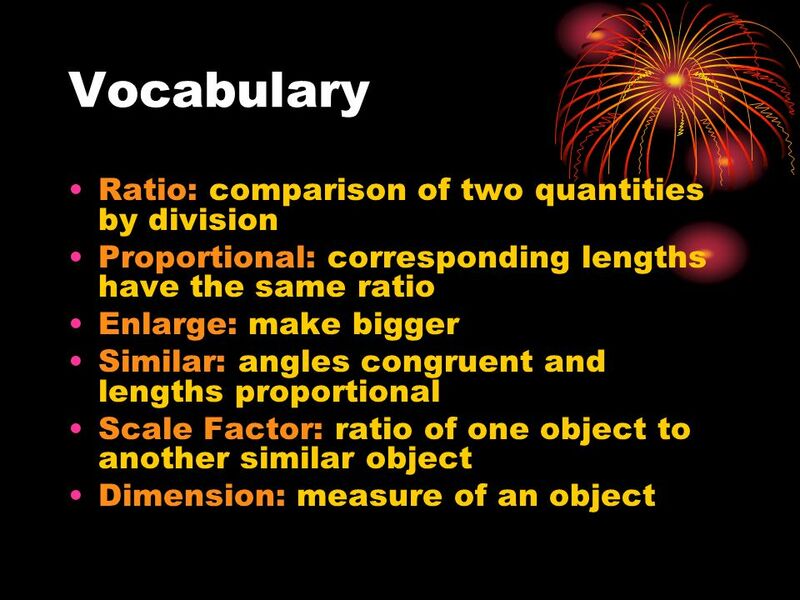 Unit 6: Scale Factor and Measurement How will you measure up? 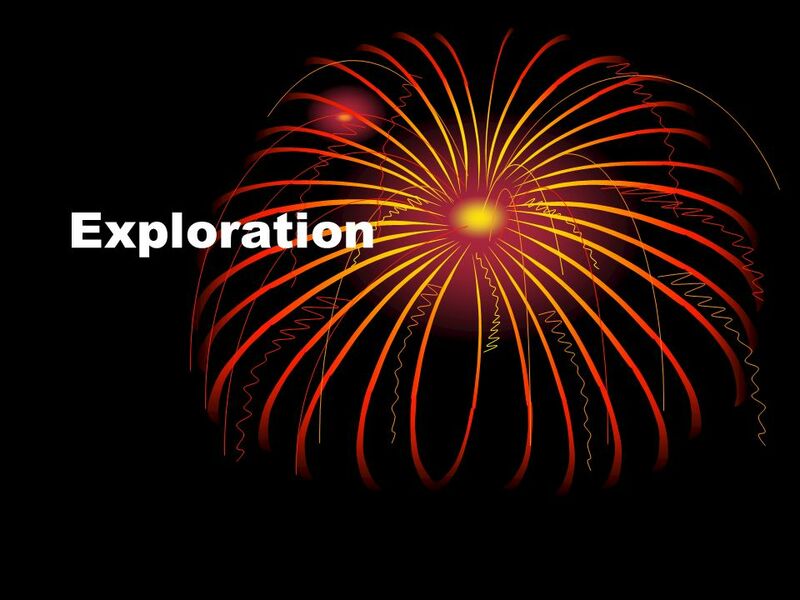 Investigations For 6 th, 7 th, and 8 th grades. Project commitment D level: part one of investigation and do two “Connections” problems completed with. 1 Geometry Section 7-1A Changing the Size of Figures Page 462 You will need a calculator with sin/cos/tan in 2 weeks. 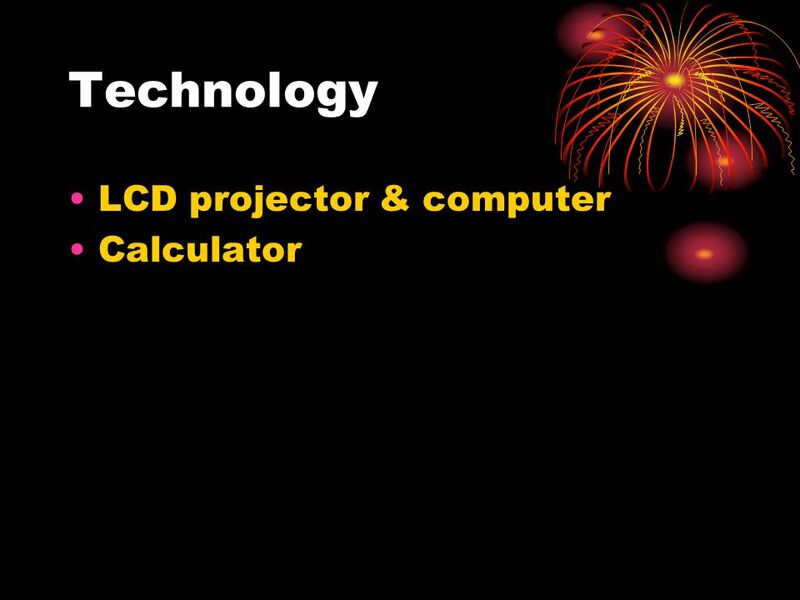 Freshmen - TI 30 XII S recommended. © Boardworks Ltd 2004 of 42 KS3 Mathematics S5 Coordinates and transformations 2. Similar Triangles & Slope In addition to level 3.0 and beyond what was taught in class, the student may:  Make connection with other concepts. 7 th Grade Pre-Algebra Focus 1: Proportional Reasoning Standards: 7.RP.1, 7.RP2a, 7.RP.2d Resource: Connected Math Program 2 Common Core Investigation.